This is a great route, beginning at Roadies bar. �It is called the BUD Ride because it is the same route Team BUD uses for their annual May ride. Roadies is in a mini mall with a large parking lot to leave your car. �Exit the lot and turn right (West) onto county road F28 (Penn St). � �Stay on this road until you must turn North to remain on paved road. �THis route will eventually head West again. �When you come to gravel, take a left and head South to Oxford. �You will cross Hwy. 6 to the Amana Colonies about half way on this leg. �Long downhill coast into Oxford. �Stop at Old Roy's for refreshments. �Leaving Old Roy's go two blocks South and take a left. �Cross the RR tracks and gear down as you come to a long uphill climb. When you arrive at a T intersection turn left. (right is gravel). �Go about two miles turn right and cross I-80, then turn left. �This will be several miles of rollers as you head to the Tiffin turn. �Turn left and re-cross I-80. �In the spring, beware of a vicious red winged black bird that nests at the overpass. �Go down hill into Tiffin. �Stop at Slim's for refreshments. 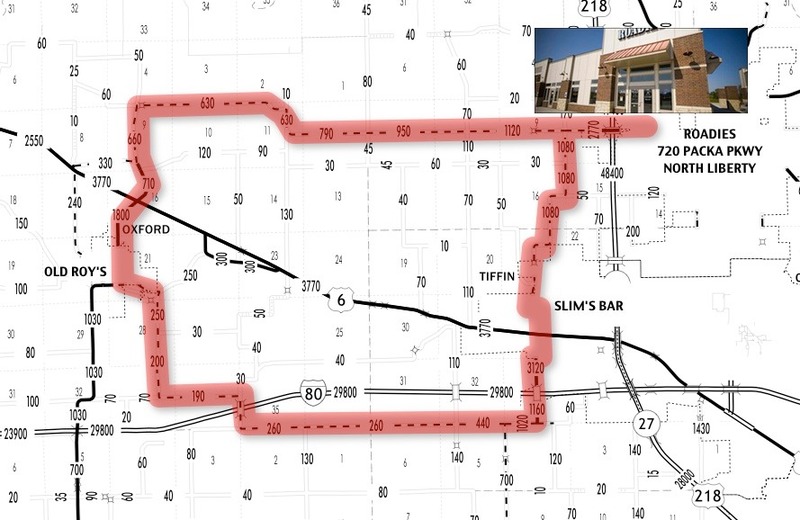 Leaving Slim's, get on Hwy 6 West for a couple of blocks and turn right onto James Ave. �Head back to county road F28. This road will take a couple of turns along the way. �When you get back to F-28, turn right and head back to Roadies.